Drew Ferguson, September 2008. 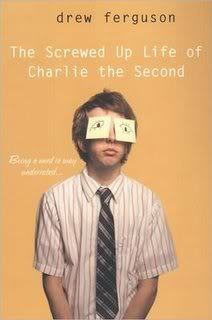 The Screwed-Up Life of Charlie the Second is about Charles James Stewart, Jr. Charlie has never quite fit in at his high school in a small town in Illinois. Tall and socially awkward, Charlie is the epitome of the typical school nerd. While his parents fight, Charles plays soccer to keep himself out of the house and out of their hair. Never formally accepted by his teammates, Charlie has a hard time trying to fit in anywhere until a new boy at school enters into Charlie’s life and changes everything. With a wry and self-debasing sense of humor, Charlie takes us through three hectic months of his life in a diary-style novel. Told through the perspective of a whiny, confused, caring, naïve and willful teenage boy, the book starts immediately with Charlie being open about being a gay teen. It isn’t so much as a coming-out story as it is a growing-up story. There are many, many issues and conflicts that Charlie encounters through a short time in this book. He deals with bullies, an overbearing and pushy father, a hot-tempered boyfriend, pending divorce, euthanasia, relationships, homophobia and more. Although there were moments of homophobia throughout the book with his schoolmates, I felt that Charlie was the scapegoat more for being a nerd than for being gay. Charlie’s wit and introspective narration made his story easy to follow, and easy to understand. He is a character that a lot of teens will relate to, gay or not. While the book was a very engaging and amusing read, I felt that there were too many hot-topic issues covered in a short span of time and too neatly wrapped up by the end of the book. This entry was posted in 2008, Drew Ferguson, gay male, guest blogger, high school, queer protagonist, realistic, secondary queer character. Bookmark the permalink.